Still busy. I’ve had my re-contracting interview, which went well. Apparently my school’s principal spoke highly of me in his evaluation. Alas, I don’t know when I’ll hear whether or not I get to re-contract, but it shouldn’t be too long. We had just one game, on Saturday morning. We lost, which was probably for the best. I started feeling lousy Saturday afternoon and was definitely sick by the evening. If we had won on Saturday, we’d have had a game on Sunday. Calling in sick for that would have forced the team to forfeit, since only five of us were going to be available on Sunday (and there were only six on Saturday, which was why I agreed to play in the first place). So. I’ll get back to Kyoto later, but right now I want to show some pictures of my neighborhood, as several people have requested. This is the front of my apartment building. It’s not pretty, but it’s not terrible. Although I should take some pictures of the spiders in the stairwells when they return with the warm weather. It gets ridiculous. 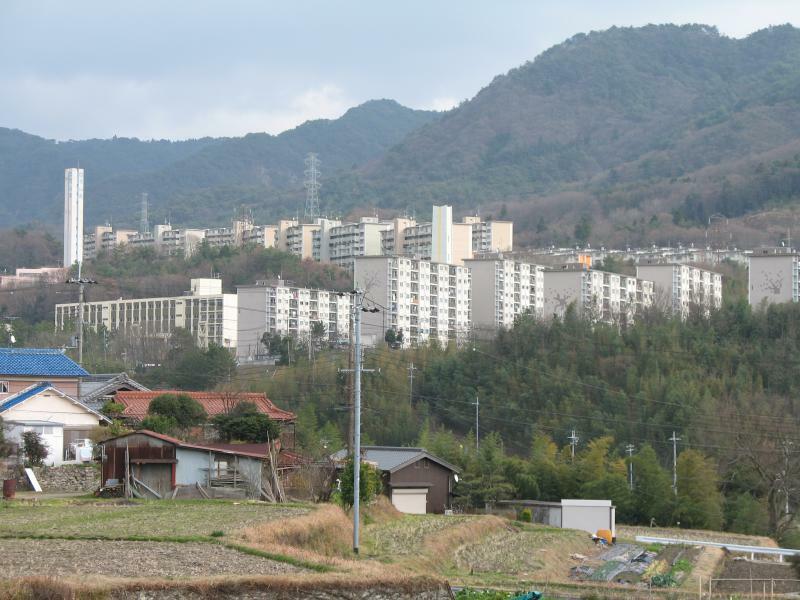 This is a shot of the apartments, taken from the other side of the valley. I think my building is the one behind the middle tower. 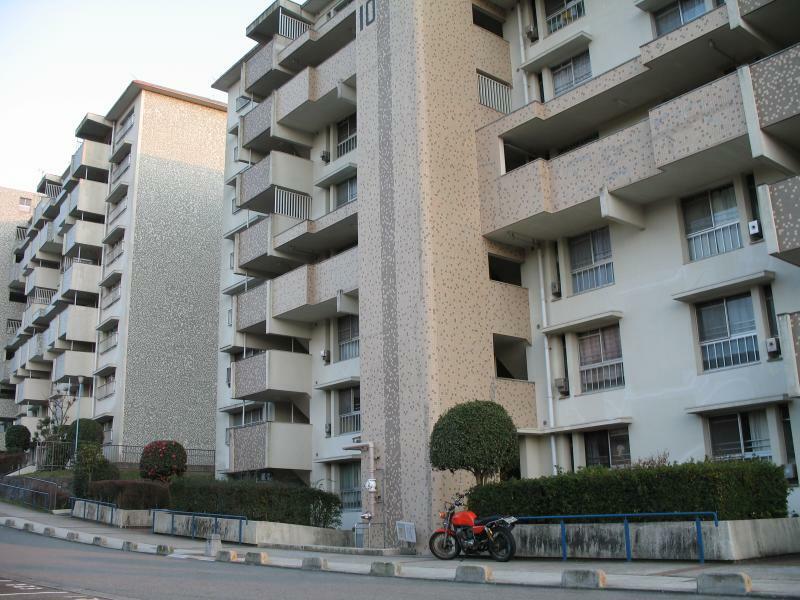 All public housing apartment complexes in Kobe have similar towers, to serve as landmarks. Kobe proper is on the other side of the mountains, to the south. Gah. This is a fraction of what I wanted to get to, but I’m sick and I need to go to bed. I’ll write some short posts during the week, if I can. I am totally failing at my goal of getting caught up to the present with my posts. I’m just too busy during the week. Oh well. On Saturday, December 2nd, I visited Kyoto for the third weekend in a row, grasping at the last remaining scraps of autumn. I got an early start, determined to beat the worst of the crowds for my first stop: Kinkaku-ji, the famous Temple of the Golden Pavilion. 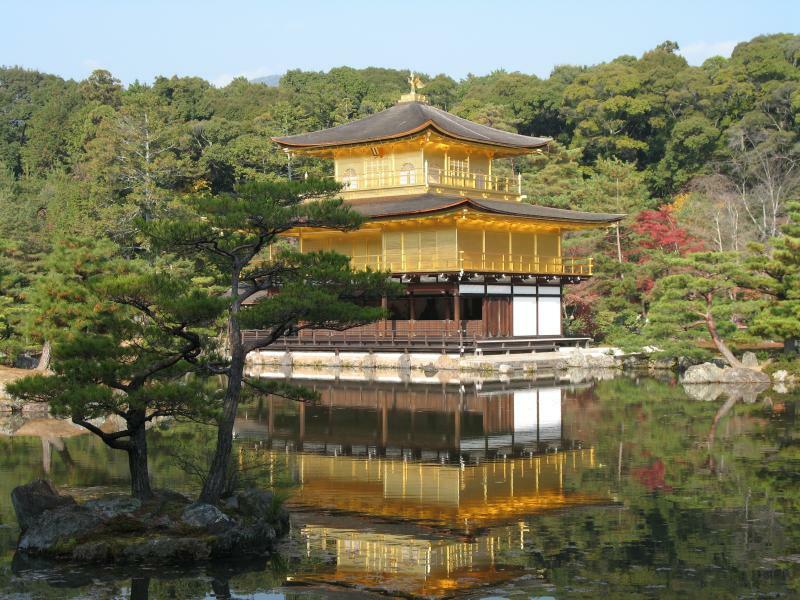 Kinkaku-ji was built in 1397 as the retirement villa of Shogun Ashikaga Yoshimitsu, whose grandson later built the Silver Pavilion. 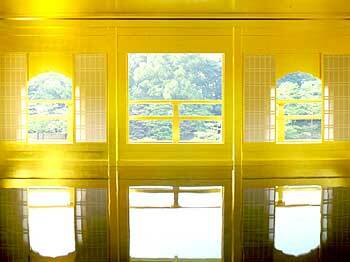 It became a Zen temple upon Yoshimitsu’s death, as per his will. Here’s a closer look from the other side. I just noticed the gilded rain gutters. That’s thoroughness. Anyway, as I was about to write before getting distracted, the three floors each represent different architectural styles. 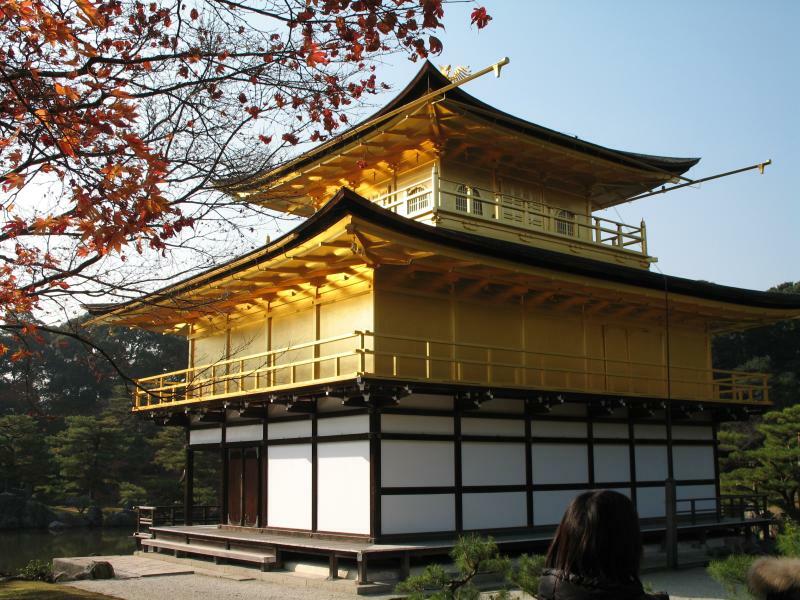 The first floor is in Heian period (794-1185) aristocratic style, the second floor is like a samurai house, and the third floor is modeled after a Chinese Zen Buddha Hall. A Chinese phoenix is on the roof. The inside of the Pavilion isn’t open to the public, but I got these pictures of the interior from the head temple’s website. 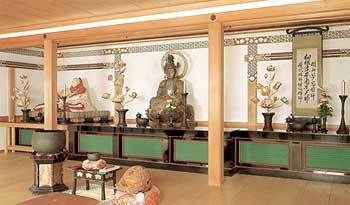 The first floor has a statue of the historical Buddha, with Yoshimitsu to the left. 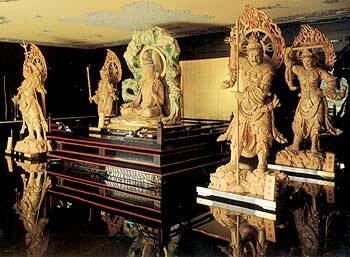 The second floor contains Kannon, bodhisattva of compassion, guarded by the Four Heavenly Kings. The third floor is called the Superb Apex. I’d have loved to go inside, but it’s understandable that it’s off-limits. Well, I’ve only covered what I did in the morning, but I need to go to bed, so I’ll just put this up now and get to the rest of the trip in my next post. Until then. I visited home for Christmas, just for a week. I didn’t buy the plane tickets until December, so my travel dates were decided by price and availability. The price was twice what it should be, but tickets for different dates went for as much as $4,000 for economy class. Obscene. I returned to Japan on New Year’s Eve. New Year’s is Japan’s biggest holiday. Everyone gathers with their extended family, and all businesses except for trains, airports, and convenience stores shut down for the first three days of the year. On New Year’s Eve, people clean their houses, and on New Year’s Day, they visit shrines and/or temples to wish for health, happiness, and prosperity in the coming year. I figured that I should get in on the festivities, but unfortunately I was sick and jetlagged, so that put a damper on things. Nevertheless, I did visit a shrine on the 1st, although it was after 4pm by the time I dragged myself there. I visited Ikuta Shrine, which is just north of downtown Kobe. After a bit of research, I discovered that it’s one of the oldest shrines in Japan, having been founded in the early 3rd century. The buildings have all been replaced numerous times, but that’s still pretty cool. Alas, I only have one picture. This is the inside of the shrine’s main building, in an area fenced off from the general public, which even so late in the day formed a veritable sea of humanity. The Shinto priest, in formal costume, is leading the man (and his family, who are outside the picture) through a private ceremony. It must cost a fortune to reserve the sanctuary for a private service. 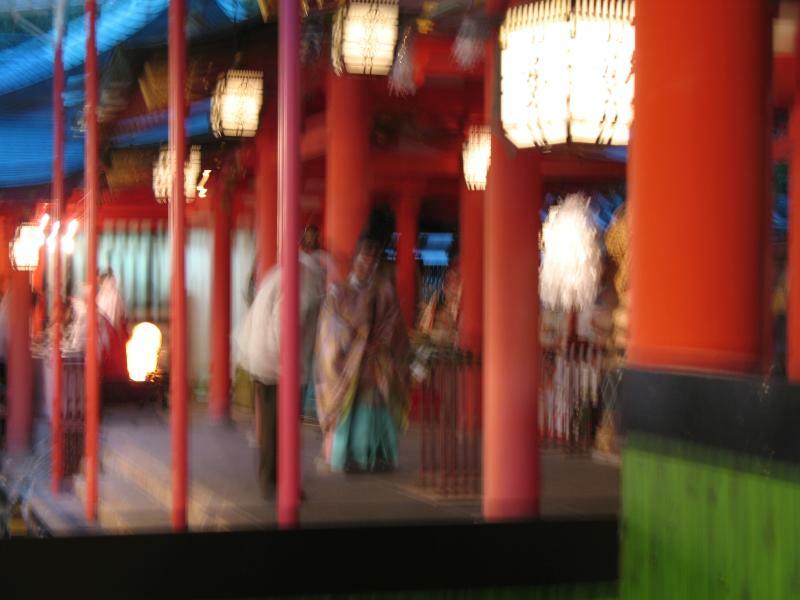 To the left, in the back, are a pair of shrine maidens wearing their characteristic red and white outfits. It’s too bad that this shot is so blurry, but then again, it gives a pretty accurate idea of how I was seeing the world at the time. On Thursday I was back at work and feeling better, but the virus seems to have made a comeback, probably from the shock of getting up early on Thursday and Friday and not getting enough sleep. Last night I went to bed around 10 and slept for 11 hours, so hopefully that will help me get on the mend. But in the meantime, I’m still sick. Blah. You are currently browsing the Erratic Dispatches blog archives for January, 2007.